Controversial plans to build an underwater dam to protect Venice from flooding will go ahead, Italian Prime Minister Silvio Berlusconi has said. The 4.5bn euro (£2.9bn) project, dubbed Mose - the Italian name for Moses - is due to be completed by 2011. "All doubts have vanished - there is no way back," Mr Berlusconi stressed. Environmentalists have criticised the project, and the mayor of Venice protested against the decision saying the city council had been bypassed. The plans envisage building 78 hinged flood barriers on the seabed which would be raised when high tides threaten the city. But some environmentalists say the 28m (92ft) high, 20m (65ft) wide structures will turn Venice into a pond and will cause more damage than the floods which periodically submerge its streets. The Italian section of the World Wildlife Fund (WWF) says shutting the city's cargo port and preventing cruise liners from approaching the city would be a more effective way of preventing the damage. Costs, estimated at 2.3bn euros (£1.6bn) when the first stone was laid in May 2004, have almost doubled since. Anti-globalisation protesters earlier this month staged a protest at the site where the barriers are being build. But Mr Berlusconi on Wednesday made it clear that although some suggestions to improve the project might be discussed with experts and possibly taken into account, they would by no means slow down works on the project. The decision to protect the lagoon city from high tides was taken in 1966, when a flood left 5,000 people homeless. 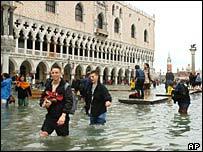 Several high tides later, in 1973, the Italian government declared Venice to be a matter of national concern. But it took another 30 years of studies, rejected proposals and debate before a definite plan of action was agreed. Currently, Venice suffering some level of flooding for 200 days every year, compared with only seven at the beginning of the 20th Century. More than 50 high tides were recorded between 1993 and 2002, compared with just five in the 10 years between 1923 and 1932. The project is named after Moses who, according to the Bible, parted the Red Sea with God's help.